If you’re hosting family or friends this Christmas, you may want to get your house into shape all ready for the big day. Here are a few ideas to equip it for festivities. Most people crave a bit extra floor space at Christmas time. Although we can’t offer you tips for actually extending your home, there are a few tips to make it look and feel more spacious. There may not be time for DIY in the lead up to Christmas, but these pointers can be used to open up small spaces whenever you feel like it. Light colours: Fresh, bright walls can open up the space tremendously. Light creams, whites, pale blues can all help the room to feel larger and more airy. Darker paint colours on your walls can make the room appear smaller. Vertical lines: Try to utilise the vertical space in your room for storage. For example, floor to ceiling shelving units and cupboards. Natural light: This is key for making rooms feel bigger. If you normally have your blinds or curtains closed, perhaps swap them for sheer, light fabrics that allow the light to permeate. Although you may already have a home insurance policy in place, check that you have cover for accidental damage. This is sometimes sold as additional cover. Christmas can be a time for mishaps (like flaming Christmas pud on the carpet or the brand new Wii through the glass door) so it’s wise to be financially covered. In addition, ensure you have adequate cover limits in place. Unfortunately, Christmas can be a risky time for break-ins – with burglars targeting expensive gifts that are left on display under the tree. If you have bought (or receive) a particularly expensive gift, such as jewellery or a laptop, make sure this is adequately covered. Very pricey items may need to be insured separately, so check with your provider. To get a seasonal ambience in your home – it’s good to indulge all the senses. Nothing says Christmas like the smell of pine trees, cinnamon, gingerbread or mulled wine. There are lots of scented candles available with special Christmas fragrances that not only look beautiful but fill your home with a festive aroma. Try the Yankee Candle range of Christmas fragrances, such as Mistletoe & Fig and Red Berry & Cedar. You could also try making your own homemade pot-pourri with dried orange pieces, cinnamon sticks, cloves and nutmeg. 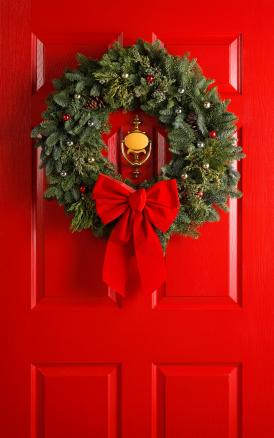 You may want to give a warm, Christmas welcome to your guests before they even set foot in your home. 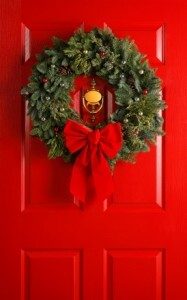 Door wreaths are an attractive decoration for the exterior of your home. They range in size and price and are widely available in the run-up to Christmas. Your local florist will probably do a classic wreath, traditionally decorated with pine cones and holly.